At the core of my research is to look at historical figures and ask questions about how our current church life is shaping up. There’s great bible precedent for this in Hebrews 11 especially. In that chapter were told of a great cloud of witnesses cheering us on. Many of them had huge flaws, but they are commended for their faith. In this vein I like to hold up some of our (also flawed) predecessors as a mirror to reflect on what our priorities as a church are now. 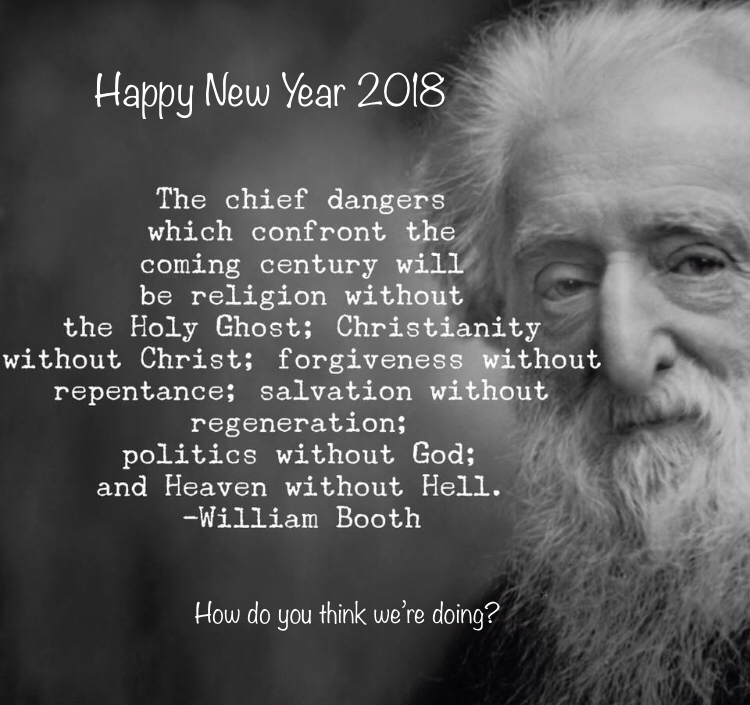 After browsing through the social media threads that seem to be taxing my fellow Christian ministers on Facebook this Christmas I saw this well-known quote today from just the beginning of the 20th Century by Salvation Army founder William Booth. Reading the social media threads I assume many think General Booth to be wrong in all but one of the statements. The ‘spirit’ we need is not the intimidating sounding Holy Ghost, but a spirit of inclusiveness, tolerance and kindness based on the example of Jesus. The sort of Christianity we need is not Christ-centric Christianity, but religion that embraces the good in those of any religions and none. Forgiveness is seen as universal so why repent? As you ‘can’t be loved any more or loved any less’ just accept salvation and relax into how are you were previously living. Don’t seek ‘regeneration’ – that sounds unnecessary, painful and might intrude on your human rights. And as for hell.. well that’s long gone. The only statement I can find evidence of agreeement on between my Facebook feed and Booth is the the desire to avoid ‘politics without God’. Here we cling to the idea of commenting in the public sphere to ensure as much inclusiveness, tolerance, and kindness as possible. If only William Booth had realised all these great insights of the last hundred years, perhaps he could have spared himself a lot of pain and anguish in his mission to the people of the slums ‘in darkest England and beyond’. ← The quest for clean air!